The Q300T T is a large chamber, turbo-pumped coating system ideally suited for sputtering a single large diameter specimen up to 8"/200 mm (e.g. a wafer), or multiple smaller specimens over a similar diameter. The Q300T T is suitable for sputtering both noble and oxidising metals. The Q300T T is fitted with an internally mounted 70 L/s turbomolecular pump, backed by a 5 m3hr two-stage rotary pump (order separately). A Pirani vacuum measurement gauge is included and a full range gauge is available as an option. Ultimate vacuum levels of around 5 x 10-5 mbar can be expected in a clean system after pre-pumping with dry nitrogen gas. 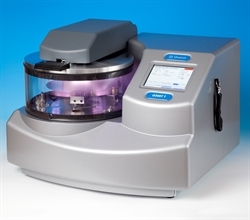 The Q300T T is fitted with three individual sputtering heads to ensure even deposition of individual large specimens or multiple specimens. For economical coating of small specimens, ‘single target’ mode can be selected. Note that it is not possible to sequentially sputter three different sputtering metals from each sputtering head - for sequential coating see the Q300T D Dual Target Sequential Sputtering System. The Q300T T is presented in a custom-moulded, one-piece case, with easy servicing access. The case houses all the working components and includes an automatic bleed control that ensures optimum vacuum conditions during sputtering. At the operational heart of the Q300T T is a colour touch screen, which allows even the most inexperienced or occasional operator to rapidly enter and store their own process data. A number of typical sputter coating profiles are already stored and, for convenience, summaries of the last 100 coatings carried out can be viewed. The vacuum chamber has an internal diameter of 283 mm/12” and comes with an integral implosion guard. The vacuum shutdown option can enhance vacuum performance by allowing the chamber vacuum to be maintained when the system is not in use. 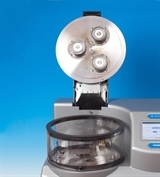 A variable speed rotary specimen stage is fitted as standard and accommodates 200 mm/8” and 150 mm/6” wafers, with other stages available as options. The touch screen interface features maintenance prompts which highlight the time of last clean, coating time since last cleaned, system ‘on time’ and time of last service.